Talk to Master Mithras once more. Talk to Simeth and have him join you in your search. Fight through the Catacombs and into the Inner Sanctum. Fight and kill Telaras Medrevan and his henchmen. Return to Tel Aranyon for your reward. Master Mithras tells you that the trapdoor in Azariah Thelas' house probably leads into the catacombs - an ancient network of tunnels that Mithras had ordered shut many years ago. He wants you to get Simeth and search the tunnels for Thelas and whoever is giving him orders. Head over to Simeth's tower and ask him to travel with you then go to Thelas' house, into the secret room, and through the trapdoor into the catacombs. The catacombs are similar in layout to an ancestral tomb. Head through the tunnels and eventually you will find a mer named Telaras Medrevan, who freely admits to being the one who has been leading the plot. He works for Mistress Rathra and wants to undermine Mithras' position on the Telvanni Council leading to his dismissal, at which point Rathra will arrange for Medrevan to take his place instead. He is furious with Thelas for causing his plans to be discovered, and kills him. 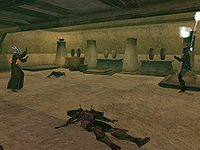 At this point, Master Mithras himself appears and you, he and Simeth must fight Medrevan and his minions to the death. Once you are victorious, Mithras tells you to take whatever you want from the tomb and to see him back in his tower for your reward. Mithras is immensely grateful for saving his town and gives you Mithras' Stanchion, a decent staff, as a reward. His disposition towards you jumps by 40 points, and you also receive two House Telvanni reputation points and three points of Reputation. If you talk to Alasha Kori in The Dancing Jug after the quest is complete, her disposition jumps by 30 and she will give you a bottle of Sujamma, and talking to Mirisun Varen in the mine will net you two pieces of ebony and a 40 point disposition boost. Once the quest is complete, asking the townsfolk about rumors may result in them saying that "The talk of the town is how you and Mithras were able to stop the problems at the mine. Apparently it was Mistress Rathra behind it. Is that true?" This results in a five point disposition bump if their disposition towards you was below 70. 10 Mithras told me that I must go into the catacombs of Ranyon-ruhn and confront Azariah Thelas, and his true master who surely hides there. He told me to get Simeth to come with me, to provide aid in the battle. 15 Simeth agreed to follow me into Ranyon-ruhn's catacombs to end the plot against Master Mithras. 20 In the catacombs of Ranyon-ruhn, I discovered Azariah Thelas and a mer I did not know, Telaras Medrevan. It appears that Telaras was the mastermind of this whole plot, and Azariah his pawn. 30 Telaras Medrevan was enraged by the discovery of his plans, and slew Azariah Thelas. 40 Before Telaras made another move, Master Mithras appeared. He told Telaras that his plans were foiled, and moved to combat him. 50 Master Mithras has slain Telaras Medrevan! He thanked me for my help in this affair, and told me to return to meet him in Tel Aranyon for my reward. 1000 Finishes quest Master Mithras thanked me greatly for my intervention in Ranyon-ruhn. He told me that I had saved not only the town, but also Mithras' reputation as a Telvanni Master. Should I need any favors from him in the future, he said, I had but to ask. This page was last modified on 6 March 2019, at 09:07.